"Eye Protector" extensions are set of extensions to adjust different browser color and brightness levels to reduce eyestrain while reading on a browser. These extensions have two primary settings one for daytime and one for nighttime. You can configure them two behave differently on user-defined daytime and nighttime durations. Currently, you can adjust brightness and color temperature to prevent eyestrain during dark hours. What is the "Adjust Screen Brightness" extension? What is the "Night Shift (Lux control)" extension? This extension is meant to control red, green and blue color levels for all web pages. The extension has two modes of operation: DIV (overlay method) and SVG (filter method) modes. In the DIV mode, an HTML DIV element is inserted on top of the entire content with a user-defined color and opacity levels. This div acts like a colorful glass and reduces the color levels and page' brightness. Note that the DIV method cannot completely remove a color level, it just reduces the color levels. In the SVG mode, an SVG filter is inserted to the page which controls the color levels based on user-defined settings. By using this method, a particular color can be completely removed from a page. For instance, if the blue color level is set to zero for nighttime, a blue box will be seen as a black box as the blue channel is killed. The SVG method is the preferred method if your browser supports it. Note that even if your browser supports this method, still it might be buggy. If applying the SVG method causes rendering issues in a page, change the mode to the default DIV method and refresh the page. 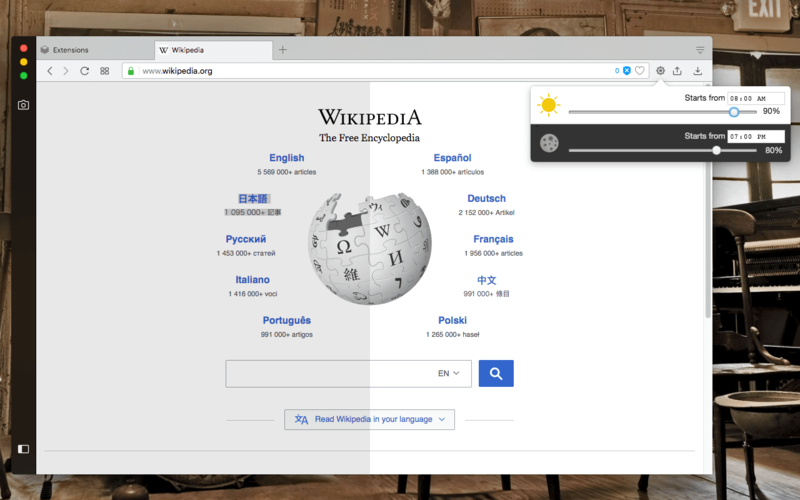 How does the "Adjust Screen Brightness" extension reduce the browser's brightness level? Basically, the extension adds a ":before" CSS box over the entire page with the user-defined brightness level. This way the total brightness of all elements in the page reduces to the level that the user prefers. To get the original brightness level use the 100% level. This will convert the overlay box to a transparent one which does not affect the brightness level at all.